Appearance Schedule will be updated as new dates or changes are confirmed. If for any reason (work, health, etc. ), James Drury is unable to attend any event, we will post as soon as possible. 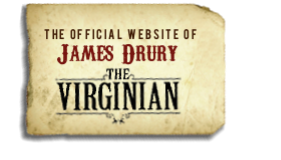 Mr. Drury's traveling depends on Mrs. Drury's health at the time of the event. But, he is eager to attend. Mr. Drury confirmed that he will not be able to make the trip out to California for the Walk of Western Stars Induction Ceremony. He sends his appreciation for this honor and his regrets that he will not be able to attend. Also attending, Robert Fuller, Dennis Holmes, Bobby Crawford, Alex Cord, Ken Farmer, and more. Mr. Drury is still accepting autographed photo and DVD requests on the website to sign and ship from home.